The Javvy Protocol serves as the underlying processes by which Javvy works quickly and effectively to provide ID Verification, an automated cross-currency exchange, and liquidity for cryptocurrency/token order fulfillment. Tremendous strides have been made to advance cryptocurrency wallets and exchanges into the exciting and disruptive industry that it is today. Yet, the desire remains for a user-focused experience to buy, sell, and use cryptocurrencies in a safe, convenient, and reliable application. This is the Javvy Solution. Javvy is the full integration of a universal wallet connected to numerous exchanges presently available to the cryptocurrency market. It eliminates the need for multiple accounts and applications while taking advantage of their respective benefits. Along with our simple and fast process for user registration and verification, Javvy brings confidence and clarity to the user as cryptocurrencies approach mass adoption. We provide all the tools necessary to securely store, use, and invest in cryptocurrency. This document details the full vision of the Javvy Solution. 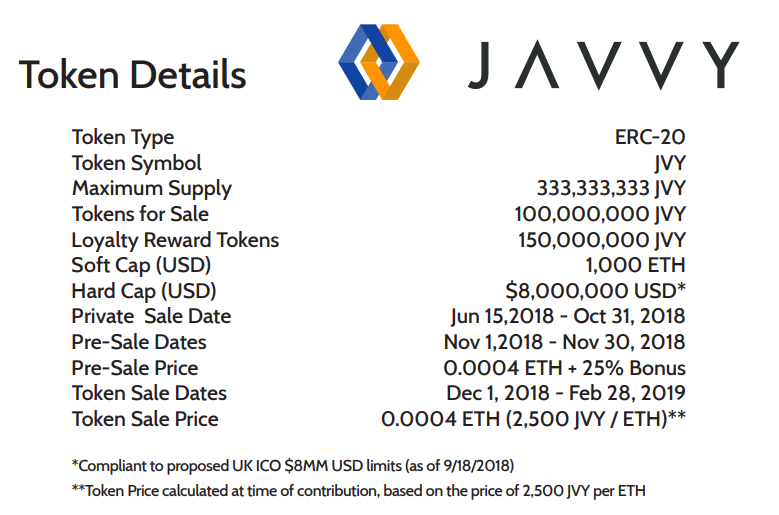 Our ICO will finance the ongoing development of features to bring the Javvy Wallet from version 1.0, currently available online, into the full vision outlined in this whitepaper.